Are you self-employed, a freelancer and have difficulty saving automatically with an inconsistent income? Do you rely solely on your business income to live on? This is a good episode to listen to if this applies to you. 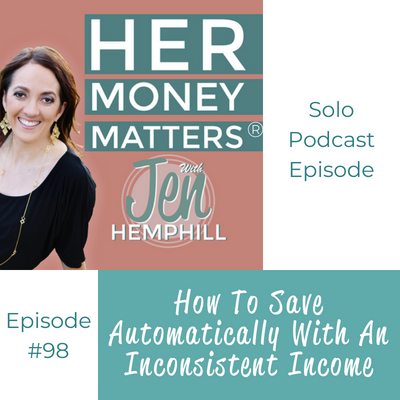 I share with you 6 steps you can take to help you save more AND I also brought in 5 personal finance bloggers who solely rely on this inconsistent income to live on. STEP #1: Know the minimum amount you need to live on. STEP #2: Know the minimum income that you are confident you will get on a monthly basis. —> Is there a way to live on this income with your minimum necessary expenses? —> Know how much you want to save, and how to get there on a monthly basis. —> How does this fit in your that minimum income you are bringing in a monthly basis? STEP #4: Have a plan for the bigger income months. STEP #6: Automate it, and know that you are in charge. BONUS TIP: Read Profit First by Mike Michalowicz, even if you are in the beginning phases and can’t implement all he suggests it is good to know and build up to. “Do a financial fire drill. Make a list of minimum monthly expenses: food, shelter, basic utilities, obligations that must be met (e.g., student loans or child support). Now that you know how (relatively) little you need to live, it should be easier to take a deep breath. Next add in things that make life nicer, such as Netflix or lunch/dinner out once a week. Things should still look affordable. If you pay quarterlies, set aside a percentage of each payday for taxes. Ideally you’d include a certain amount of cash to go into the EF (Emergency Fund). Fund each of these categories consistently. The low-earning months will, with luck, be balanced out by the higher-earning ones. Thanks for the FinCon Community for sharing their tips and advice! I want to remind you that you can share what you want me to talk about on this podcast after all this show is for you! If you have a specific question you’d like me to tackle share that with me (or even guests you’d like me to interview). There is a brief survey over at jenhemphill.com/shareyourvoice . I want to thank Melissa for her great question in our community that inspired this post.